Handling Tips: 40° F. Keep dry. 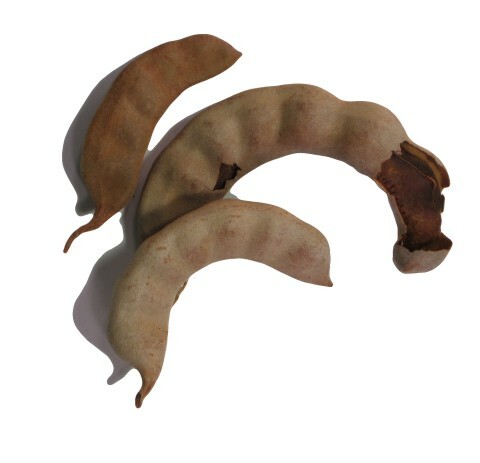 General Information: The fresh tamarinds are shipped in their thin, brittle pods that are easily removed. Under the shell is a thick, sticky meat that is the consistency of dried dates. Under the meat are rather large and easily removed seeds. The meat can be used to make sweetened tamarind water as a beverage or used in curries, candy, chutney or preserves. Its flavor is sour, yet fruity. Applications: The tender, immature, very sour pods are cooked as seasoning with rice, fish and meats in India. The fully-grown, but still unripe fruits, called "swells" in the Bahamas, are roasted in coals until they burst and the skin is then peeled back and the sizzling pulp dipped in wood ashes and eaten. The fully ripe, fresh fruit is relished out-of-hand by children and adults, alike. The dehydrated fruits are easily recognized when picking by their comparatively light weight, hollow sound when tapped and the cracking of the shell under gentle pressure. The shell lifts readily from the pulp and the lengthwise fibers are removed by holding the stem with one hand and slipping the pulp downward with the other. The pulp is made into a variety of products. It is an important ingredient in chutneys, curries and sauces, including some brands of Worcestershire and barbecue sauce, and in a special Indian seafood pickle called "tamarind fish". Sugared tamarind pulp is often prepared as a confection. For this purpose, it is desirable to separate the pulp from the seeds without using water. If ripe, fresh, undehydrated tamarinds are available, this may be done by pressing the shelled and defibered fruits through a colander while adding powdered sugar to the point where the pulp no longer sticks to the fingers. The seeded pulp is then shaped into balls and coated with powdered sugar. If the tamarinds are dehydrated, it is less laborious to layer the shelled fruits with granulated sugar in a stone crock and bake in a moderately warm oven for about 4 hours until the sugar is melted, then the mass is rubbed through a sieve, mixed with sugar to a stiff paste, and formed into patties. This sweetmeat is commonly found on the market in Jamaica, Cuba and the Dominican Republic. History: Native to tropical Africa, the tree grows wild throughout the Sudan and was so long ago introduced into and adopted in India that it has often been reported as indigenous there also, and it was apparently from this Asiatic country that it reached the Persians and the Arabs who called it "tamar hindi" (Indian date, from the date-like appearance of the dried pulp), giving rise to both its common and generic names. Unfortunately, the specific name, "indica", also perpetuates the illusion of Indian origin. The fruit was well known to the ancient Egyptians and to the Greeks in the 4th Century B.C.